The kids over at Saturday Night Live have a running gag sketch about the FOX News morning program, Fox & Friends, and its propensity for making up the news, lying about it, then being forced to make corrections for its goofs later in the day. In SNL’s parallel parody universe, these corrections show up in a quickly-moving scroll onscreen. You’ll have to pause your TV or streaming online video to catch all of the one-liner throwaway jokes added to each sketch. 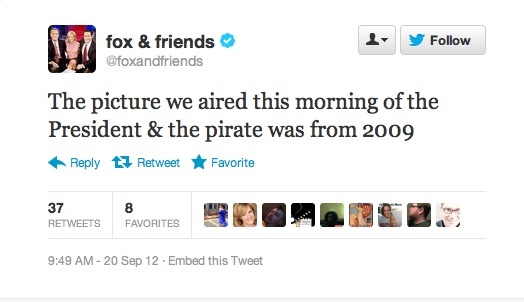 Here are the corrections from the Sept. 20, 2012, SNL Weekend Update Thursday “Fox and Friends” sketch! That’s what happened last night for the first 2012 edition of SNL Weekend Update Thursday in primetime. The show opened with SNL’s version of “Fox & Friends” (played by cast members Taran Killam, Vanessa Bayer and Bobby Moynihan) covering up for that leaked Mitt Romney speech (with Mitt played by Jason Sudeikis), as well as other hush-hush videos of Romney (including one of him playing Cash Cab, with Kate McKinnon as Ann Romney and Tim Robinson as Ben Bailey). Roll the clip. That didn’t happen this week. Nor even this year. It was in 2009. And back then, it wasn’t even real. It was a joke for Obama’s speech to the White House Correspondents Association.